The Alaskan Way Viaduct is no more. The last car passed through on the evening of Friday, January 11th, 2019 leaving the downtown Seattle waterfront eerily quiet. The silence didn’t last long, as the demolition crew began tearing the structure down, a process that will take until June to complete. The long-term tradeoff, however, promises to be worth it. With traffic diverted underground and plans to rejuvenate the waterfront with bike paths, art, walkways, and greenery, this urban park space has a bright future. The revitalization of the downtown waterfront is a long time coming. Historically, much of Seattle’s waterfront was just water. 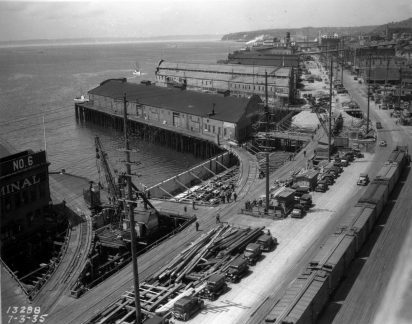 Before the filling in of tidal flats, building of the seawall and construction of Alaskan Way, before European settlers set eyes on the Salish Sea, Seattle was Duwamish land; fast forward to the late 19th century and early 20th century the waterfront was the industrial and transportation heart of the city. 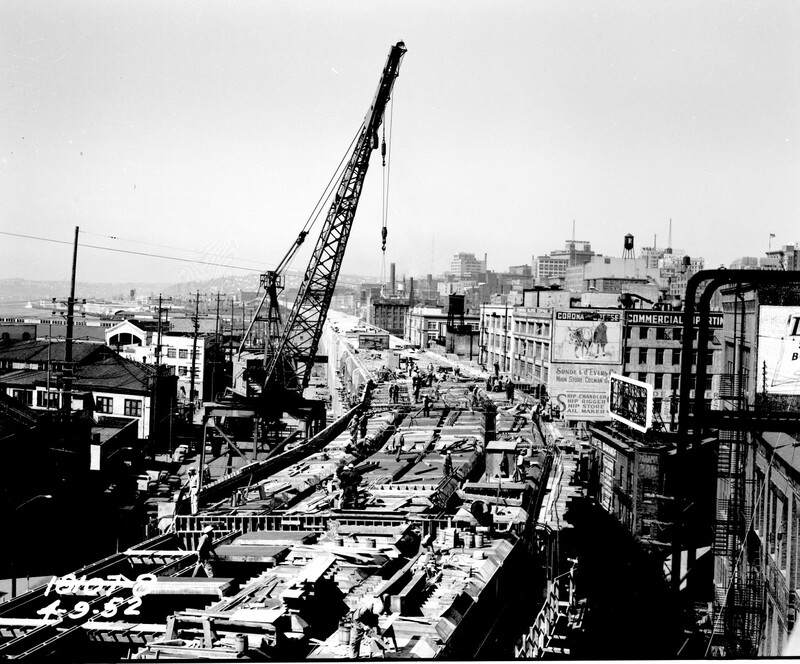 The Alaskan Way Viaduct was constructed in the 1950s to improve downtown traffic and allow drivers to circumvent the industrial core of the city. However, once the area began to transition away from industry, the viaduct functioned to cut the waterfront off from the rest of downtown. Not long after its construction, various interest groups began campaigning to remove the viaduct. In the 1960s, the waterfront was no longer the bustling hub of industry and commerce; the port moved south, and the viaduct had already cut off the area from the rest of downtown. Thus, business, community groups, city planners and government officials alike participated in planning to revitalize the area. Their goals were to protect the historical sites, provide access to the water, and improve the downtown-waterfront connectivity. Many proposals for the waterfront over the next few decades failed, but the Waterfront Park was eventually completed in the ‘70s. However, it was woefully designed and difficult to access, so the area has never truly reached its full potential. In 2001, the 6.8 magnitude Nisqually earthquake rattled the Alaskan Way Viaduct, causing serious damage and alerting the City of the need to remove or replace the structure. Finally, 18 years after this wake-up call, the viaduct is being torn down. 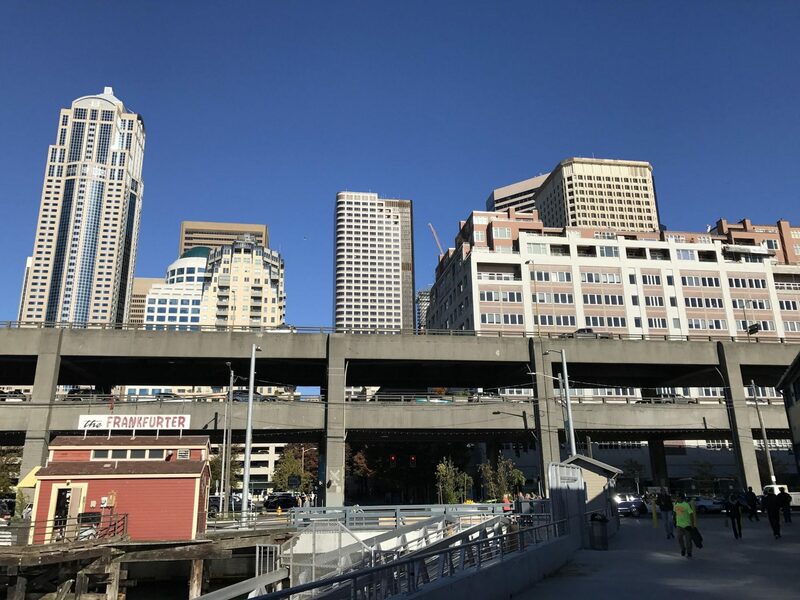 The viaduct closure made headlines across the state, promulgating fear of “via-doom” or the “Seattle squeeze” that promised choked roads for commuters. Before the opening of the Highway 99 tunnel, traffic jams were not as terrible as expected and commute times remained relatively steady. Additionally, more than double the usual numbers of bicycle commuters were recorded in January, and commuters were encouraged to take public transit. This begs the question: did we really need to build the tunnel? Many who supported removing the viaduct argued that it was unnecessary to replace the structure at all. Their argument rested on the theory of induced demand, which when applied to traffic, posits that congestion does not improve when new roads are built or widened, rather that more roadspace increases congestion simply because it’s available. People adjust their behavior according to what is accessible to them. Ultimately, of course, the Highway 99 tunnel was built and opened this month despite various setbacks, including the world’s largest tunnel-boring drill named Bertha getting stuck underground for nearly two years. Another component of the transportation plan is a new Alaskan Way surface street that will be eight lanes in certain areas. 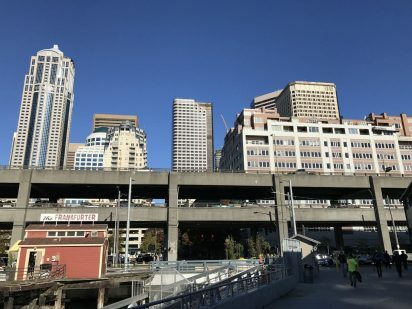 So, while the new central waterfront will certainly be an improved space without the eyesore viaduct structure, it may still suffer from the traffic pollution and noise of nearby cars. But these decisions are all in the past now, so let’s focus on what the future holds for a viaduct-free waterfront. The ongoing construction of the waterfront’s new habitat beach located just south of Coleman Dock. Credit: Katy Dalton. Friends of the Waterfront Seattle, the nonprofit partner of the City that’s spearheading the planning, outreach, and fundraising for the new waterfront park has a bold vision for what the 26-block area will look like by 2023. 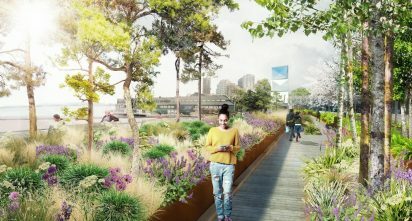 Bike and pedestrian paths, hundreds of trees and greenery, local and tribal art, free public events, a floating dock, restored shoreline habitat and a connecting promenade to Pike Place Market are some of the main attractions designed by James Corner Field Operations, the same architect behind the New York City Highline. The complete waterfront park is slated to open in 2023, but some components, like the new Pier 62 are slated to be complete by the end of 2019, provide an interim way to enjoy the waterfront while we all patiently wait for the construction to end. 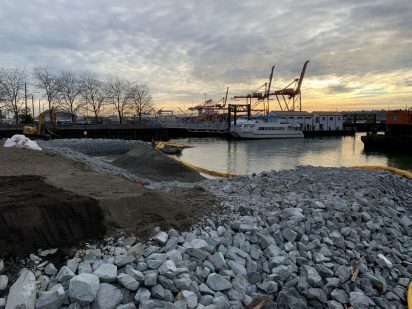 One unique feature of the new waterfront, the habitat beach located south of the ferry terminal at Coleman Dock, is intended to re-create some of the natural rocky beach habitat for salmon while simultaneously showing the public what the land they’re standing on might have looked like before the city existed. This integration of habitat restoration within the larger plan to create an urban park is the key to success. Seattle’s shoreline may always have to deal with competing uses of industry, transportation, recreation and conservation. The more we can balance those uses with the stewardship of Puget Sound, the better off we’ll all be in the long run. One thing holds constant throughout the history and future of the Seattle waterfront: transition. This transition we’re in right now is a big one, but the overall outlook for the new waterfront park is a huge step in the right direction.